Create tasty drinks for friends and family with our luxury barware metallic mugs. Perfect for serving your favourite tipple, cocktail, mocktail, beer or ideal as a soft drink mug. 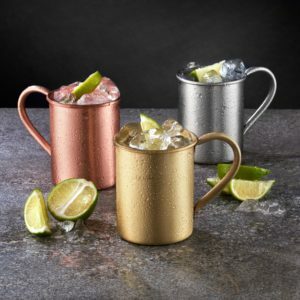 Our Moscow mule mugs are made of stainless steel with a metallic finish and each mug cup is finished with a protective clear lacquer and ensures there is no tarnish taste. Just in time for those scorching summer days relaxing in your home or outdoor bar. The cool cocktail mugs are a suitable stylish barware alternative to the traditional cocktail glasses or barware glasses. Our beer mugs come in a choice of a copper mug, silver mugs, or gold mugs. This cold drink mug not only makes a snazzy beer mug but can be an unusual present for beer drinkers, a cool gift for cocktail lover or a gorgeous home present for cocktail lovers. To view more on our mule mugs just click on the images below. This entry was posted in Home Decor, Home Accessories and tagged barware, barware accessories, mule mugs, cocktail mugs, beer mugs on 6th July 2018 by admin. Our new personalised coffee stand and unusual coffee pod holders are the perfect way to start your day in the morning. Our wooden stands are novel storage ideas for coffee pods and for holding your favourite mug. They make a unique gift idea for a coffee drinker or a novel present for a coffee addict. Our coffee capsule storage stands are great coffee station ideas for any kitchen or room. One coffee storage stand can be personalized with your own wording and is made of solid European oak with leather. The other coffee pod station is made of solid sapele wood with leather and comes with a phrase that says But first coffee. 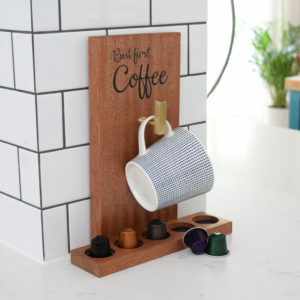 Create your very own coffee station and a neat way to organise your kitchen space. 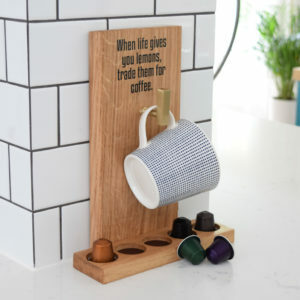 Don’t miss out on our wooden coffee stands/ Nespresso capsule holders which make wonderful and thoughtful gift suggestions for coffee lovers. Just click on the photos below to find out more. This entry was posted in Personalised Gifts, Home Decor and tagged home decor, coffee, storage ideas, gift ideas on 3rd July 2018 by admin.